Regenerative medicine/tissue engineering is the process of replacing or regenerating human cells, tissues, or organs to restore or establish normal function. It is an incredibly progressive field of medicine that may, in the near future, help with the shortage of life-saving organs available through donation for transplantation. Introduction to Tissue Engineering: Applications and Challenges makes tissue engineering more accessible to undergraduate and graduate students alike. It provides a systematic and logical eight-step process for tissue fabrication. Specific chapters have been dedicated to provide in-depth principles for many of the supporting and enabling technologies during the tissue fabrication process and include biomaterial development and synthesis, bioreactor design, and tissue vascularization. The tissue fabrication process is further illustrated with specific examples for liver, bladder, and trachea. 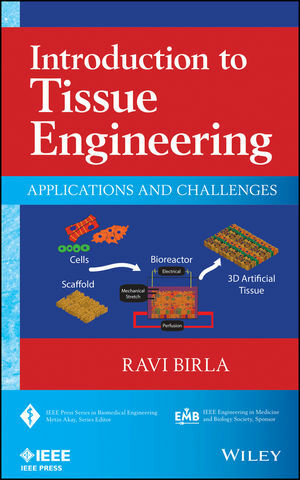 Section-coverage includes an overall introduction of tissue engineering; enabling and supporting technologies; clinical applications; and case studies and future challenges. As pioneering individuals look ahead to the possibility of generating entire organ systems, students may turn to this text for a comprehensive understanding and preparation for the future of regenerative medicine. RAVI BIRLA, PHD, is Associate Professor in the Department of Biomedical Engineering at the University of Houston. Dr. Birla’s research focuses on the fabrication of 3D cardiovascular constructs, including bioengineering 3D artificial heart muscle, cell-based cardiac pumps, tissue engineering ventricles, and bioartificial hearts.